A vector is usually expressed in Cartesian coordinates but can be converted (in Abelian algebras) to the same number of "dual" or "polar" coordinates . Three cases of Abelian algebras are shown, based on the Abelian cyclic groups , (or ), and . In each case, a twofold symmetry converts the unsigned group elements into half as many real ) vector elements via the minus sign, giving complex, hyperbolic, and terplex algebras, each with vector duals, division, powers, and roots. 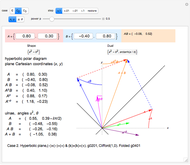 Case 1, , shows complex Cartesian/polar duals , as the familiar complex plane (the Argand–Wessel diagram), related by , . 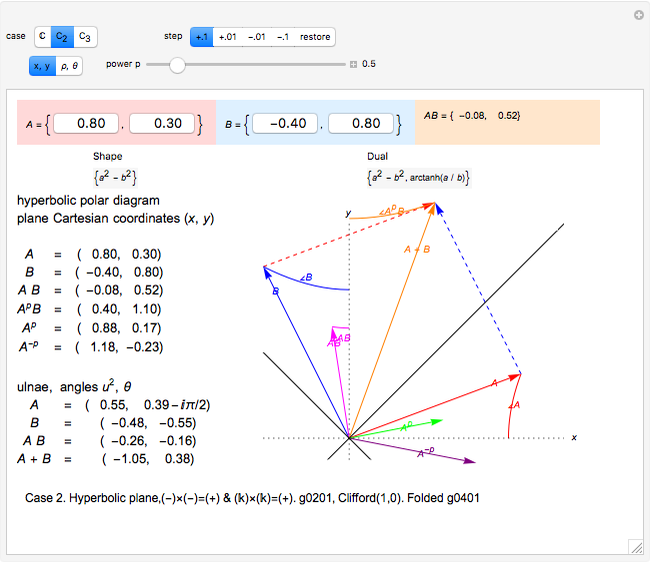 Vectors and appear as Cartesian points (arrowheads) and polar points (radius, angle pairs). Vector addition is Abelian, (the translated second vector is shown as a dashed line from the head of the first). Vector multiplication and powers are less familiar; is the oriented area of the parallelogram . The power slider changes or animates . The inverse power, , is also shown. As these can become large, they are scaled down by half in the graphics. Division is multiplication by . You can click the components of or to change them by the current setting of "step"; the values and the diagram respond. Note that angles add, , while lengths multiply—the length of is the product of the lengths of and . 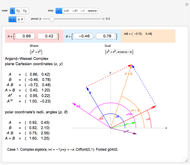 The radii and angles can be stepped after switching from Cartesian to polar. Clicking "restore" returns to the original settings. Case 2, based on the Klein four-group , has often been rediscovered as the hyperbolic plane, double numbers, Study numbers, Cayley–Klein algebra, perplex numbers, etc. It has two linear conserved factors and , which combine to conserve . This defines a hyperbolic dual with an "ulna" (named by analogy with "radius") and a hyperbolic angle . Unlike , which is restricted to one quadrant, the angle exists in all octants. It is shown here as labeled hyperbolic arcs, replacing the circular arcs of case 1. 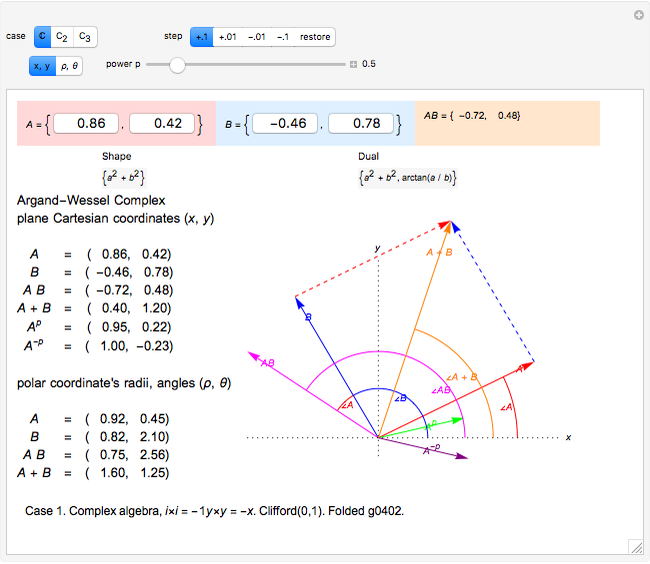 As complex angles and a branch cut are involved, the " " option only accesses a limited region ( , ), and angle addition is only correct up to . Case 3, , is a little-known "terplex" algebra that can be simulated (with loss of information and elegance) by projection onto the complex plane. It has three degrees of freedom; in the Cartesian formulation and in the polar (cylindrical coordinates) formulation. 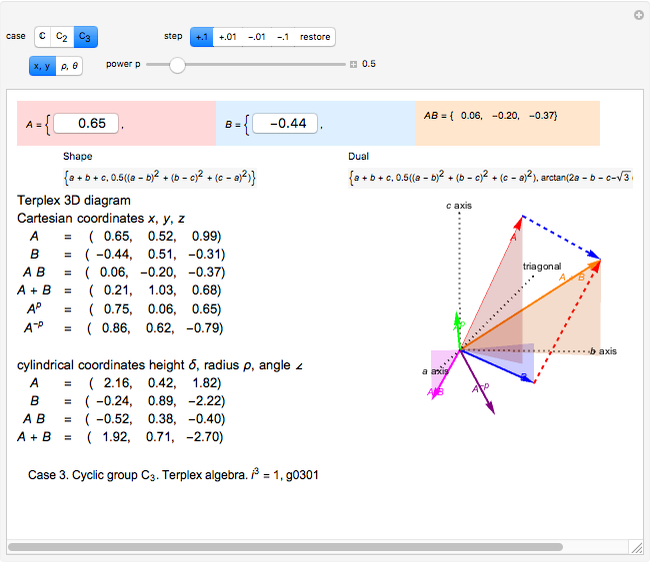 Click the "triagonal" or ) and drag until it shrinks to a central point, corresponding to projection onto the complex plane. 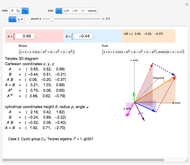 The pale triangles show the projection onto for each Cartesian vector, or onto and in cylindrical coordinates. Vector addition is widely used; it can be visualized as attaching the tail of one vector to the head of another. Vector multiplication gives a directed area in two dimensions, but is not so simple in higher dimensions. Products and powers of complex numbers are complex numbers, and provide 2D vector multiplication, division, and powers. 3D geometry is non-Abelian, requiring the use of Clifford algebras, so 3D Abelian vector multiplication is not widely applicable. and are division algebras, but have "real divisors of zero". When (the black diagonal lines) the inverse would become infinite, were it not for the "projection" of the calculation into a sub-algebra of reduced symmetry. In , infinite inverses correspond to or being zero. The multiplication procedure used here (hoopTimes) "factors out" any zeros, "projecting" the result into a sub-algebra while "rejecting" a remainder. Roger Beresford "Abelian Algebras: Sums, Products, Duals, Powers"